If you want to build inexpensive Digital Signage advertising display based on the household TV or PC Display, or you already have a display of the desired size from 7 to 150 inches, there is a simple solution to make it. Use professional advertising media player that supports video files of standard, Full HD or 4K quality. 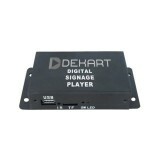 Even the cheapest Dekart Digital advertising player will constantly show video on your TV around the clock. 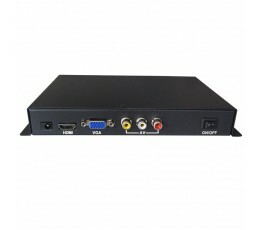 You will see better image quality and feature set if you choose more expensive Digital Signage player. But quality and stability is equally flawless all models. Digital signage advertising player is usually mounted behind the monitor on double sided tape or screwed to the frame of the TV. Player will start to operate autonomously 24 hours a day immediately after you connect power cable to the outlet or USB port. Such Digital Signage system will not provide internet management function, but it is good for selected areas in shops and supermarkets where you want to focus consumer's attention on a particular product. You may also look at digital signage player with network control via Ethernet, wi-fi or 4G networks. Colorful moving picture on the advertising display attracts the attention much more than printed materials and text on the stand or shield. Hence, the use of Digital Signage players especially popular in perfumes, electronics, DIY stores, pharmacies, travel agencies, wherever you want to notify visitors about new products, promotions and discounts. To start using the player you need to follow couple of steps. It is enough to copy media files - audio, video, and audio to SD or USB flash and install this media player. Media player will start playback of playlist automatically. Demonstration of graphic files goes as a slide show with effects. 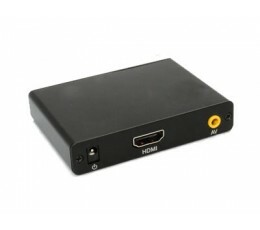 Digital Signage player is convenient to use as the sound source for voice of the premises. Device starts to play videos, slides, or audio tracks immediately after loading, several additional options can be configured. Ligth-weight media players are easy to fix with double sided 3M brand tape or plastic cable ties for wire. Some models include a full-time brackets for mounting on a flat surface. The mounting must provide reliable fixation of the cables, and air flow, for continuous operation of the device. The price of Digital Signage advertising player varies depending on the type and quality of supported video files - from standard video up to Full HD or 4K. Price of a player may depend on the functionality, quality and quantity of video outputs, and housing material. With increasing of price Digital Signage player will grow only the image quality and feature set, but not the reliability. Reliability is equally perfect in all our models. If you have limited budget, just buy the cheapest advertising player, we guarantee its reliability and all the described functionality. You will be happy with this purchase. Advertising players always are in stock in our warehouse. You have the opportunity to choose the appropriate accessories for your player - USB flash, memory cards, brackets, cables. We provide technical support to our clients with installation and use of the our devices and converting multimedia data for playback. 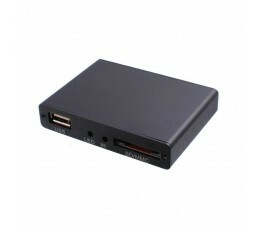 Buy Digital Signage player for advertising today, we offer the best prices for bulk orders on the market.